Skunks are one of the most popular species of wildlife that we are called upon to control in The Woodlands. Skunks can be found living in crawlspaces, under front and rear porch and patio and basements in homes and businesses throughout Texas. They also take up residence under sheds, in hot tubs and outbuildings. A shed is normally elevated off the ground and is perfect for raising a family. If there is shelter skunks will seek it! A dead Skunk under the porch, patio or crawlspace is a service that we perform. This can include the deodorization of the area. Skunks do occasionally die in unusual places and they must be removed as soon as possible. We have even found a dead Skunk in a wall. Leaving the Skunk will only make the problem worse and cause further damage to your home and attract other animals and insects. 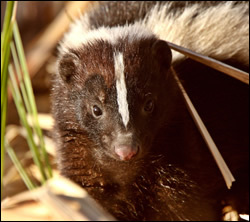 The Woodlands skunk removal is a necessary service to protect your home and family. Removing the skunk is the first step to making your home healthy again. Get rid of skunks the right way, before the problem gets out of control. ©2013-2019 Wildlife Removal The Woodlands Texas.